Good luck Nicholas. I like the pale green cover of Pearseus, Virgil. Yay, exciting stuff! 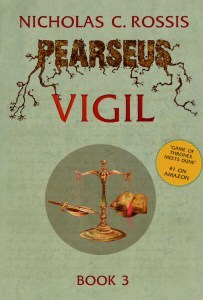 Pearseus: Vigil has now been released to into the wild to fend for itself on Amazon. This marks the rebranding of Rise of the Prince as book #1 in the series, with Mad Water now being #2 and Vigil #3. As per your suggestion, Pearseus: Schism has been relaunched as Book 0, or Prequel to the series. I have now changed the book covers and updated their description to match the new classification. I will also change later today the 3-book bundle, to include Vigil instead of Schism, and will raise its price accordingly.